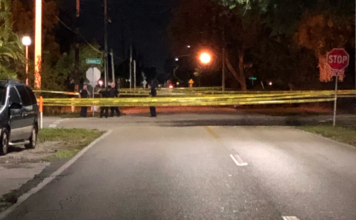 The Fort Myers Police Department held a news conference to release details in a shooting that left a police officer in critical condition. Officer Adam Jobbers-Miller, 29, was shot after responding to an incident at a Marathon gas station on MLK Boulevard around 7:30 p.m. Saturday, according to police. One of his fellow officers then took him to Lee Memorial Hospital where he underwent emergency surgery. As of Monday afternoon, Jobbers-Miller is currently in critical but stable condition, according to police. The suspect, Wisner Desmaret, 29, is in police custody at Lee Memorial Hospital with non-life threatening injuries. Desmaret faces eight felony charges with the most egregious being attempted first-degree murder. Chief Diggs said, they received a call from a citizen at the Marathon Gas Station on MLK regarding a man harassing a group of people at 7:16 p.m. The suspect left the gas station and was located by police on Flint Drive, where officers approached Desmaret who then fled on foot. Diggs said Desmaret then shot Officer Jobbers-Miller and ran into the Marathon Gas Station. When backup arrives, Desmaret was also shot and apprehended. He was transported to Lee Memorial Hospital. FMPD is also asking the public for any witness or video footage you may have of the incident. You can call the detective at (239)321-8011 or the main number at (239)321-7700. On Saturday, July 21, 2018, Fort Myers Police Officer Adam Jobbers-Miller was protecting and serving the citizens of Fort Myers, when he responded to a 911 call at a gas station on Dr. Martin Luther King, Jr. Boulevard. Upon arrival, Officer Jobbers-Miller confronted the suspect and during that violent encounter, the suspect shot Officer Jobbers-Miller, causing critical, life-threatening injuries. Every day, the Lee County Sheriff’s Office works alongside our brothers and sisters at the Fort Myers Police Department to protect our community. Regardless of the color of uniform or patch on our sleeve, we are all one family. I want to be crystal clear: this cold-blooded attack on a Fort Myers Police Officer is an attack on one of our own. This heinous act of violence is unacceptable and will not be tolerated. The Fort Myers Police Department has identified the suspect as Wisner Desmaret, a career criminal with an extensive criminal history, and who has zero regard for human life. This type of senseless act of violence could be committed only by the lowest of the low. Our community can sleep more soundly knowing that this violent criminal is off the streets, rightfully sitting in a jail cell, where he belongs. The men and women of our law enforcement community stand strong – knowing the citizens of Lee County support them and are equally disgusted with this violent attack on our hometown hero. I am honored to work alongside the finest and bravest in Lee County. Despite the risks and threats we face every day, we will continue to do everything in our power to protect the citizens of our community. We at the Lee County Sheriff’s Office are praying for a full and speedy recovery for Officer Jobbers-Miller. Arrest records from the Florida Department of Law Enforcement show he’s been picked up by the Fort Myers Police Department 15 times since 2002. Less than three days before the scene unfolded Saturday night on Martin Luther King Jr. Blvd., Desmaret was released from custody in Sarasota. He was deemed competent to stand trial, and faces charges for possession of cocaine and carrying a concealed weapon after being admitted for mental health treatment in March, according to court records. Desmaret was arrested 24 times in the state of Florida since he was 14 years old for charges including burglary, drug possession and resisting arrest, according to court records. The charges were eventually dropped, as well as a several other charges from arrests in Lee County until 2016, according to court records. Court records show there wasn’t enough evidence in some other cases. Desmaret was also at the center of another standoff in 2011 with Fort Myers police. Desmaret is still in the hospital with a non life-threatening injury. It’s unclear when he’ll be booked into the Lee County Jail. Neighbors of Officer Jobbers-Miller say the shooting is a reminder of how law enforcement officers put their lives on the line every single day. “When it’s a law enforcement officer I think it takes a toll or a fireman or somebody that’s serving this community,” said Don Lampher. A quiet neighborhood separated by expansive lawns. “Although we have neighbors next to us it’s still kind of semi private,” Lampher said. The neighbors are connected after one of their own was inured: fellow resident Jobbers-Miller. “Thank you for your service (Officer Jobbers-Miller) … sorry … thank you for what you do and I think it’s a thankless job,” Lampher said. Bob Snedon used to work for the Lee County Sheriff’s Office. When he noticed something unusual in the neighborhood shortly after the shooting, he immediately took action. Snedon followed the patrol car to Officer Jobbers-Miller’s house, but by the time he got there, the car was already past the property’s gate. “I really didn’t see anything that looked weird, so I said, ‘OK it must be fine,’ … (but) little did I know,” Snedon said. Neighbors want Jobbers-Miller to know they’re standing by him. Another vigil is planned for Jobbers-Miller at 9 p.m. at Lee Memorial Hospital. The Fort Myers Police Department reached out on Facebook Monday morning asking for blood donors after one of their officers was shot in the line of duty Saturday. According to the FMPD Facebook page, they are in need of donors, specifically type O negative, however they said any blood donations would help. Anyone who wants to donate can do so at the Lee Memorial location at 2776 Cleveland Avenue. You can also read more about blood donations here. The incident was terrifying, according to the store clerk working at the gas station at the time. He said several employees and customers were inside the convenience store at the time. He described it as a war zone. Now, multiple bullet holes can be seen around the business. Witnesses said they saw two men trying to get away from police and ran inside the shop to take cover. After a shootout with officers, witnesses say they say two men running out the back of the gas station. Police consider this an active and ongoing investigation. Police created fundraising page to help Jobbers-Miller’s family with expenses. Click here to learn more. Trust WINK News to bring you the latest information as it becomes available. 7:16 p.m. Citizen called 911 saying suspect was hassling a group of people at the Marathon Gas station. 7:19 p.m. Responding officer made contact with suspect Wisner on Flint Drive. Approx. 7:26 p.m. Officer Jobbers-Miller is shot. Approx. 7:29 p.m. Officer Jobbers-Miller is taken to the hospital by another officer. Approx 7:30 p.m. Suspect barricaded himself inside Marathon Gas Station. Between 7:30 – 8:00 p.m. Suspect is shot by an officer and transported to Lee Memorial with non-life threatening injuries. 9:04 p.m FMPD confirms in a press conference an officer is in ‘Serious condition’ and in surgery. 9:05 p.m. Gov. Rick Scott talks with Fort Myers Police Chief Derrick Diggs offering any resources needed. 9:25 p.m. Chief Derrick Diggs confirms a shooting left officer and suspect injured. 2 p.m. Chief Diggs names Wisner Desmaret, 29, as the suspect in the shooting. Officer Jobbers-Miller remains in critical but stable condition.